Turnberry Lane Machine Embroidery patterns to make beautiful table runners! This snowman will bring joy to your heart and to your table! It would also be lovely as a vertical wall hanging as well. Use your embroidery machine to stitch 6 panels that fit together to make the runner or stitch it as a whole. There are 3 sizes included in the panels and as a whole. Small 4 1/2" x 14 3/4"
Medium 5 1/4" x 17 3/4"
Large 6 1/4" x 21 1/2"
Vintage pieces are quickly becoming my favorite things. You can use your embroidery machine to make your own vintage table runner using simple embroidery and easy piecing. This is a great scrapper too! The designs are included in several sizes. 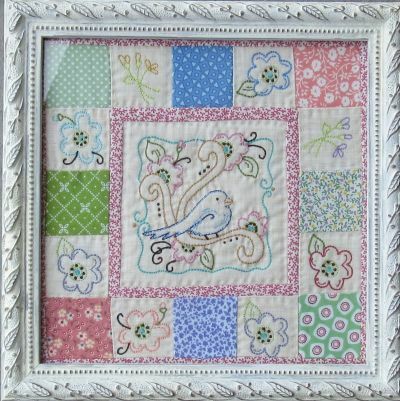 A framed piece pattern using the small size embroidery is also included. This scarecrow is nothing but cute! Have fun using your embroidery machine to stitch this simple embroidery. The easy piecing to finish the runner makes this a fun addition to your table. The design is include in 3 sizes stitched in panels or as a whole. Small 5" x 14 1/2"
Med. 6" x 17 1/4"
Large 7" x 20 1/2"
I love these cute bugs combined with coneflowers, my favorite flowers! This little table runner is quick to stitch using your embroidery machine and easy to piece in any colors you love. The designs are included in 2 sizes to enjoy! Use your embroidery machine to stitch this joyful Santa table runner. This is for Santa lovers everywhere! The runner is included in 3 sizes that is pieced and requires no multi-hooping. It is also included as a whole in 3 sizes! Large 5 1/2" x 8 7/8"
The right and left candy cane blocks are also included in 3 sizes. The Santa design is also included as a whole in 3 sizes. These happy snowmen are all wired together ready to add whimsy to your winter table. Use your embroidery machine to stitch six panels that fit together to make the runner. These are included in 3 sizes! 3 sizes of 6 panels each that fit together are included: Large measures 5 3/8" x 7 1/2" Medium measures 4 1/2" x 6" Small measures 3 1/2" x 4 7/8"
Use your embroidery machine to stitch this cute snowmen runner to enjoy all winter long. There are 3 sizes included to play with! 3 sizes of 6 panels each that fit together are included. Large 5 1/4" x 8"
Medium 4 1/4" x 6 3/4"
Small 3 1/2" x 5"
This table runner is quick and easy to stitch out with your embroidery machine. You can make it in 3 sizes and make it as long as you need. 3 sizes of 7 panels each that fit together are included. Large panel meaures 5 1/2" x 7 3/4"
Medium panel measures 4 1/2" x 6 1/4"
Small panel measures 3 1/2" x 5"
Finished size 18"x 55 1/2"
Use your embroidery machine to stitch this country fence and enjoy the colors of fall. Just add a scrappy border to make this autumn table runner. 3 sizes of 6 panels each that connect to make the runner are included: Large fits a 145mm x 255mm oval hoop and measures 5 3/8" x 6 3/4" Medium fits a 145mm x 255mm oval hoop and measures 4 1/4" x 5 1/2" Small fits a 100mm x 130mm hoop and measures 3 1/2" x 4 3/8"
Finished size 20 1/4"x 54"
Snowmen, snowmen everywhere, deep down in the meadow fair! Use your embroidery machine to stitch this cute table runner and bring winter to your table. 3 sizes of 6 panels that fit together are included: Small panel measures 3 3/8" x 4 7/8" Medium panel measures 4 1/4" x 6" Large panel measures 5 1/4" x 7 1/2"
Large size measures 6" x 7 3/4"
Medium size measures 4 1/2" x 6 1/2"
Small size measures 3 3/4" x 5"
Finished size 18" x 56"
Use your embroidery machine to stitch this fun and festive table runner. Large measures 5 1/2" x 8"
Medium measures 4" x 6 1/8"
Small measures 3 3/4" x 4 7/8"